In large bowl, beat sugar and butter with electric mixer on medium speed until well blended. Beat in lemon peel, lemon juice and egg. With spoon, stir in flour, baking powder and salt until dough forms. Remove dough from bowl; place on large sheet of plastic wrap. Flatten dough into 6-inch round; wrap in plastic wrap. Refrigerate 30 minutes for easier handling. Heat oven to 350°F. Work with half of dough at a time; refrigerate remaining dough until needed. Shape dough into 1-inch balls; place 2 inches apart on ungreased cookie sheets. With floured scissors and starting at top of each ball, snip each in half, without cutting through bottom. Snip each half into thirds. 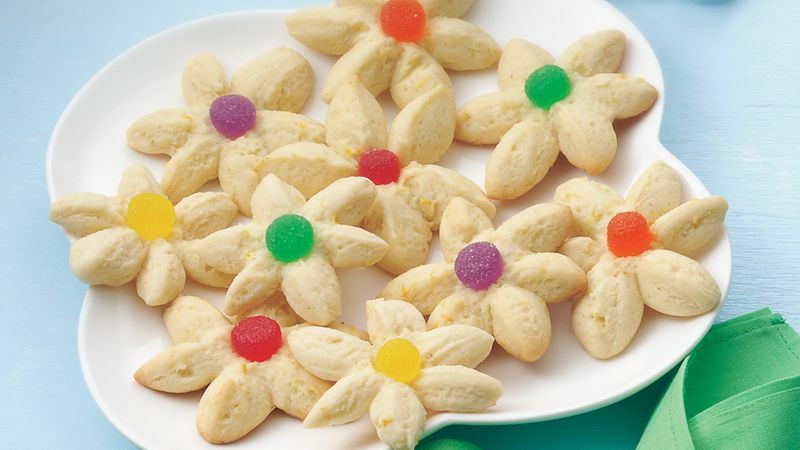 Gently open cookie balls to form 6 petals. Place gumdrop half in center of each. Bake 8 to 11 minutes or until edges of cookies are light golden brown. Cool 1 minute; remove from cookie sheets. Vary the appearance and flavor of these cookies by substituting candied cherry halves, nut pieces, chocolate chips or candy-coated chocolate pieces for the gumdrops.